The Challenge Mike and his wife, Lisa, rooted Glacier's Edge Vineyard and Winery, 1636 SE 85th St., in a challenge from Mike's father, Jim. Jim failed in his own attempt at wine making. "He decided that I should go out and grow some grapes and make some wine, so we did," Mike said. "We planted 125 vines and that grew into 500, and pretty soon we had 1,200 in the ground, and what are we gonna do with all these grapes?" Their first answer was to sell commercially. Jim was there for their first harvest in 2009. Mike says his dad went along to the winery and watched as they crushed and pressed the grapes. "It was just wonderful for him," Mike said. "The next weekend, he died." But the challenge lived on and became a tribute. Two thousand more vines and a few amateur medals later, Mike, who teaches at Washburn Rural High School, and Lisa, a physical therapist, took the plunge. Glacier's Edge officially opened in May 2014. "We had talked about it for a couple of years, and it just kind of came together. Why shouldn't we give it a try?" Lisa said. A Growing IndustryThey aren't alone. The Kansas Department of Agriculture says Kansas has about 350 acres of grapes. According to the Kansas Grape Growers and Winemakers Association, those grapes encompass more than 30 vineyards and support two dozen wineries. The Department of Agriculture says the Kansas wine and grape industry poured nearly $11 million into the state's economy in 2014. Recent changes in Kansas law make it easier for wineries to share the fruits of their labor. A 2009 law allows Kansas farm wineries to obtain a special-order shipping license, which allows them to ship directly to customers in Kansas and customers in states that allow outof-state wine shipments. The law also allowed farm wineries to get a license to sell unopened bottles at a single farmer's market. Just this year, the legislature amended that law so farm wineries now may sell at any farmer's market statewide. It wasn't until 2012 that wineries could sell unopened bottles of their products at special tasting events and wine by the glass at their farm locations. Lisa says that allowance is what enables wineries such as theirs to offer customers an experience. "People want to see vines. People want to come in and smell fermentation happening," she said. "We want them to come taste our wine, experience it, learn about it, learn about grapes. Maybe there's a red you don't care for, but the next red you'll love. Or a white." The Wine Experience Beyond taste, a visit to Glacier's Edge truly is an experience for all the senses. The wine making takes place in a room just beyond the tasting area, allowing the scent of the process to permeate the building. Plus, visitors may be lucky enough to see Mike take the cover off a large vat and "punch down" the crust on a batch of fermenting grapes—the rich color of the juice a delight for the eyes as you hear and see the bubbles of carbon dioxide gasses break the surface as they're released. Mike says they'll stir each vat through a breakdown process for about a week before the grapes are pressed. It will take another year or two—or more—before the wine is ready to drink. "Wine is something that you don't set a date to release it—the wine sets the date," Lisa said. "It might be something we're trying to produce and have ready to go in September, but it might not be ready until January." Of course, it all starts with the grapes. With Mike and Lisa both maintaining full time jobs in addition to the winery, they rely on family and friends willing to help. During the six to eight week grape harvest stretching from late August into early October, they invite them into the vineyards to pick by hand, lured by the promise of lunch. Bountiful Harvest The industry's growth is paying off for the Steinerts. A building expansion will open in time for the holiday season, with more planting to follow. 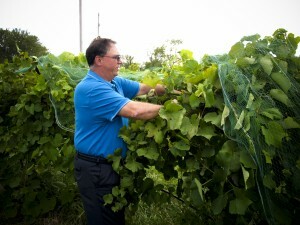 Mike says it takes three to five years to get a grape vine to produce from a planting, which can be a challenge since it takes an average of 13 pounds of grapes to make a gallon of wine. Glacier's Edge wine is made from grapes they grow themselves, plus grapes purchased from five other vineyards within a 40-mile radius of Topeka. The Steinerts also take part in a "wine trail" with other area wineries, so they all can support each other in serving up homegrown flavor. "What the previous thought was about Kansas wine is wrong," Mike said. "We are producing some very good products and people need to come and drink local." Mike also might share a story or two about his dad while he pours you a glass. He thinks Jim would be impressed with how he's answered the challenge. Glacier's Edge is open 4 p.m. to 7 p.m. Friday, noon to 6 p.m. Saturday and noon to 5 p.m. Sunday. They also host tours and special events, and take part in First Friday Art Walk.